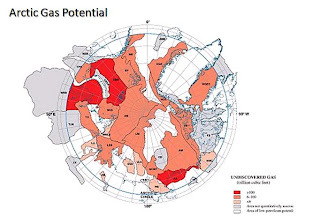 Haynesville Play: The Haynesville Shale Resource: Arctic Gas to Remain Stranded Indefinitely? Everyone knows that there is lots of gas in the Arctic region, both in Alaska and Canada. The big question with all of these resources has long been, "when are we going to get the pipeline capacity to move this stuff south?" With the emergence of the Haynesville Shale and other shale plays in the Lower 48 as well as shale plays in Canada, the question becomes, "does anyone need our gas?" Here is an interesting article from the Canadian National Post that puts the issue of the stranded arctic gas in perspective. The story discusses the Canadian situation as well as the proposed Alaskan AGIA pipeline. These are truly interesting times in which we live.